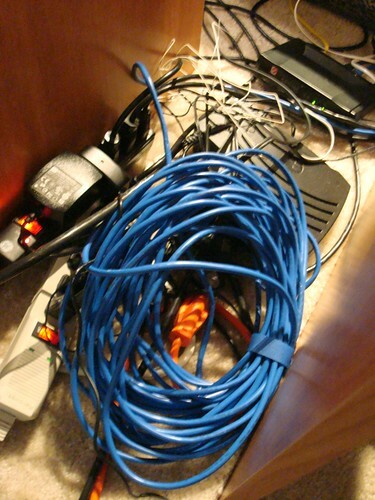 We've bought a 12 plug outlet with the intention of replacing this tangle with some semblance of order. That is on this weekend's to-do list. Especially important since my father, king of "OMG THAT COULD CATCH FIRE AT ANY SECOND", is coming to visit weekend after next. The paternal guilt field that makes you feel guilty about doing things you know your parents' would not approve of (even if they are nowhere around) is gaining strength.